Wave is YOUR public transportation provider! 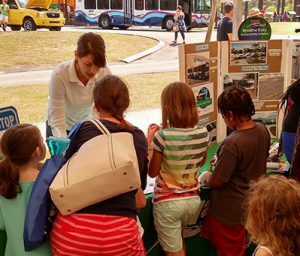 We participate in community events, partner with local nonprofits and municipalities, and provide outreach to schools, clubs, associations, and other groups. We also support local programs for people with disabilities and people age 65 and over through the award of transportation grants. Would you like to partner with us, or invite us to participate in your event? Give us a call at 910-202-2045, or send an email to vlacer@wavetransit.com. Get to know Wave at an upcoming event! Wave Transit offers an annual opportunity for nonprofits, local government, and private providers of public transportation to apply for grant funding to support transportation projects for people age 65 and over and people with disabilities. The 2019 grant application period is now closed. The 2020 call for projects opens on November 1, 2019 and closes on January 9, 2020. The Brunswick Center at Leland, Brunswick Senior Resources INC.